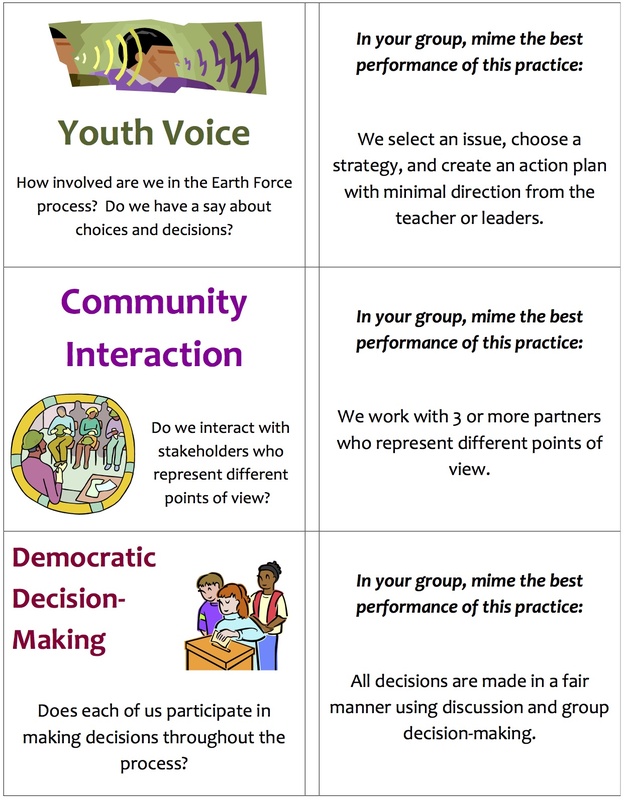 Supported by local partners and experts, educators use the Earth Force Process curriculum to incorporate service-learning and civic action into the classroom. Youth will observe issues and strengths in their community. Youth will use democratic decision-making to choose one of their issues to address. Youth will learn all they can about their issue and come up with a policy or practice related to it that they would like to change. Youth will choose a strategy that they will implement to address their issue. Youth will create and implement the strategy they’ve chosen. Youth will reflect on the Earth Force Process and think about how their project will be maintained. This module introduces Community Problem Solving as a teaching and learning strategy. As such, it is the ‘practical’ application module that builds on the ideas for citizenship education developed in Module 7. It also draws on the ideas about experiential, enquiry and values education, Future Problem Solving and learning outside the classroom in other modules. Community Problem Solving provides students with an opportunity to practice the skills that are needed to participate in finding solutions to the local issues that concern them. This helps to develop the important citizenship objectives of learning for a sustainable future and integrates skills – for both students and teachers – of using experiential and enquiry-based strategies. It also integrates skills in the planning of values clarification and values analysis with the possible solutions so students can take action to help achieve a sustainable future. •To develop an understanding of Community Problem Solving, especially as it may be used in education for sustainable futures. •To identify the skills students need to participate in Community Problem Solving. •To explore questions and issues that may be encountered when teaching through Community Problem Solving. •To identify teaching and learning strategies that may be used as part of a Community Problem Solving project. •What is Community Problem Solving? Barrett,T., MacLabhrainn, I. and Fallon, H. (eds) (2005) Handbook of Enquiry and Problem-based Learning. Irish Case Studies and International Perspectives, AISHE, Released under Creative Commons Attribution-NonCommercial-ShareAlike 2.0 licence. Bardwell, L., Monroe, M. and Tudor, M. (1994) Environmental Problem Solving: Theory, Practice and Possibilities in Environmental Education, North American Association for Environmental Education, Troy, Ohio. Bull, J., Cromwell, M., Cwikiel, W., Di Chiro, G., Guarina, J., Rathje, R., Stapp, W., Wals, A. and Youngquist, M. (1988) Education in Action: A Community Problem Solving Program for Schools, Thomson-Shore, Dexter, Michigan. Hungerford, H. et al. (1988) Investigating and Evaluating Environmental Issues and Actions: Skill Development Modules, Stripes Publishing Company, USA. Jensen, B.B. and Schnack, K. (1997) The action competence approach in environmental education, Environmental Education Research, 3(2), pp. 162-178. McCain, T. (2005) Teaching for tomorrow: teaching content and problem-solving skills, Corwin Press. OECD (1995) Environmental Education for the 21st Century, OECD, Paris. Stapp, W., Wals, A. and Stankorb, S. (eds) (1996) Environmental Education for Empowerment, Kendall/Hunt, Dubuque. This module was written for UNESCO by Bernard Cox, Margaret Calder and John Fien from material and activities originally written by Eureta Janse van Rensburg and Debbie Heck in Learning for a Sustainable Environment (UNESCO – ACEID). What would your community look like if it were on course to a sustainable future? •A clean and safe environment? •A diverse and vibrant economy? •People who respect and support each other? •Celebrations of cultural, historical and natural heritage? •Co-operation and power-sharing between citizens and government? •Affordable health care for everyone? These are all features of a healthy and sustainable community. Community Problem Solving is a strategy for working step-by-step towards this goal. This module begins with an exploration of issues and problems in your own local community. Q1: List five issues or problems you are concerned about in your community. It may be useful to review your ideas from these activities as a starting point when making your list. Q2: What skills or experience do you have that might be helpful in finding a solution to any of these problems? Q3: What are you currently doing to help address any of these problems? Review reports of ‘success stories’ of young people and their teachers working to solve local community problems: cleaning up graffiti, saving energy, a river clean-up, providing recreation for senior citizens, publishing a community environmental inventory, and so on. Activity 2 WHAT IS COMMUNITY PROBLEM SOLVING? Read a case study about the Park Beach Coastcare Project. This is an account of the way a group of students in Australia helped restore a beach near their school. Analysing the case study will help clarify what is involved in Community Problem Solving. •What do you feel about the circumstances and events in the case study? •What do you think were the learning outcomes for the student? •In what ways are the teaching/learning strategies used in the case study different from strategies most often used in your school? •What skills did the teacher need to teach this way? •What problems do you think the teachers in the case study might have faced when they included this activity as part of the curriculum? 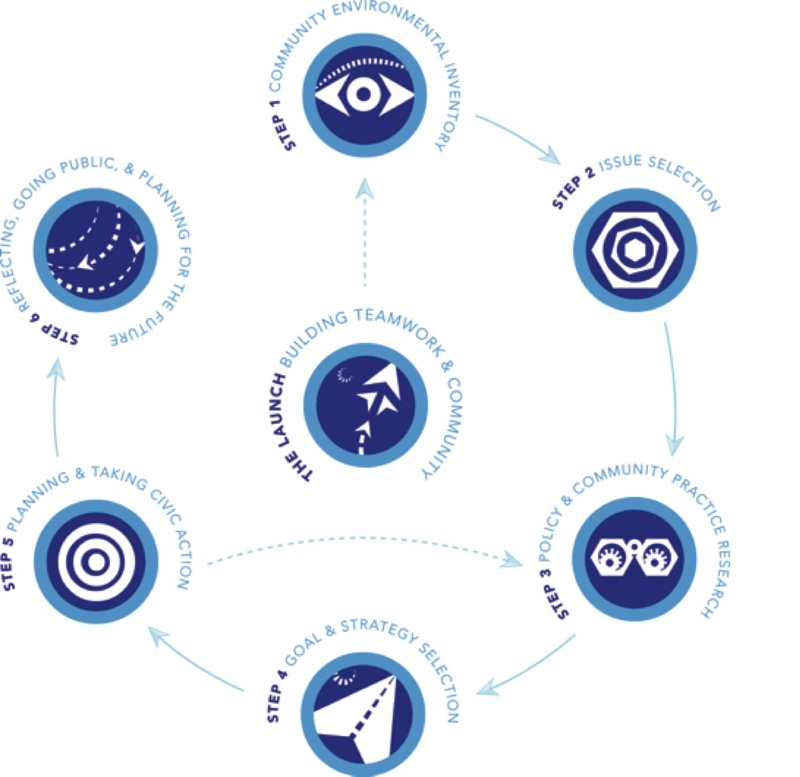 Community Problem Solving is a teaching and learning strategy that helps students learn to participate actively in addressing local community concerns, with a view to creating a more sustainable future. All these steps are important but, no doubt, you noticed that the above list is not in a logical problem solving sequence. Re-arrange the steps into a more logical sequence. The eight steps in Community Problem Solving do not have to be followed in a strict order. For example, as students develop confidence in Community Problem Solving, the need to assess and develop their skills will diminish. And often, new issues for investigation will arise as you progress through the steps, requiring a recycling backwards and forwards through the steps. What is important is that the steps be used flexibly and be adapted to local circumstances, to your own students, and to your own approach to teaching. Q5: Review the case study from Modules 15 and 24 about a geography class in Nepal that worked in their home village to develop a local sustainable development plan. Identify which of the eight steps were used and in what order. Q6: Use your understanding of the Park Beach and Nepal case studies to identify four distinctive features of Community Problem Solving as a teaching/learning strategy. Q7: Explain how you could use the Community Problem Solving approach to guide students through the study of a local issue. Review a teaching guide for student participation in solving local transport problems. Service learning – through which students volunteer to work on projects in their communities (not necessarily problem-solving ones) – has a long tradition in education in some countries. Examples of service learning projects include: volunteering to assist in a hospital, kindergarten or other community centre; working in a youth conservation project; and developing a community education and information campaign around a topical issue. Service learning is a common action that students and schools choose as a way of acting on – and achieving – the visions of a sustainable future that are developed during a Community Problem Solving project. •Over 95% reported that they were satisfied with their community service experience and that the service they performed was helpful to the community and the individuals they served. •Over 90% felt that all students should be encouraged to participate in community service. •87% believed that they learned a skill that will be useful in the future. •75% said that they learned more than in a typical class. •Approximately 40% reported that the service experience helped them think about and/or learn more about a future career or job. •the overall measure of civic attitudes. The impacts on civic/social attitudes were most evident among the high school students in the study. Participants in high school service-learning programs showed significant impacts on service leadership and the overall civic attitudes scale and a marginally significant impact on attitudes towards diversity. Middle school students, in contrast, showed some gains in the measures of civic attitudes, but none were statistically significant. •they were committed to service now and later in life. These are all good indicators of a very clear and positive contribution to active citizenship for a sustainable future. Source: Summary Report: National Evaluation of Learn and Serve America School and Community-Based Programs, prepared for The Corporation for National and Community Service by The Center for Human Resources, Brandeis University, USA, 1999. Source: Adapted from Bull, J. et al. (1988) Education in Action: A Community Problem Solving Program for Schools, Thomson-Shore, Dexter, Michigan, pp. 267-269. It takes a skillful teacher to teach skills to students. Think back to a recent lesson when you taught your students a new skill. Recall what you did first, how you proceeded and what your students did in each step of the lesson. For example, you might begin by analysing a skill to identify its parts and demonstrate them to students. Q8: List some steps you usually follow in teaching a new skill. •Analyse the skill to identify its parts. •Motivate the students so they realise they need to learn the new skill. •Demonstrate the whole skill, with students watching. •Do a second demonstration, step by step, and comment on each step as you work. •At the end of each step, students should carry out the same activity as demonstrated. •Observe the students at work and offer individual coaching where possible. •Provide the students with opportunities to use the skill so they can perfect it. Encourage students to judge their own performances. •Some students might not be used to teachers asking them to choose the topic (ie. the local problem) they want to study. •Some students could be puzzled when the teacher sets a problem but does not tell them the answer. •Some students lose their concentration when they are taken out of the classroom on fieldwork. •Sometimes local problems of interest to students may be the cause of controversy in the community. Q9: Identify some teaching ideas that could prevent problems such as these. Selecting an issue that is practicable for students to investigate is a key aspect of planning for Community Problem Solving. •The locations are readily accessible to students. •There is no serious risk to the safety of students at these places. •The projects are within the range of ability of students. •There is a genuine need in the community for this problem to be solved. •Students believe the problem is significant to them. Q10: Rank these criteria in order of importance. It is important to bear these criteria for selecting problems in mind. However, experience indicates that students are most motivated when they work on problems of their own choosing. Q11: Identify suitable teaching and learning activities that could be used at each of the eight steps in Community Problem Solving. Download a booklet on how to teach Community Problem Solving. Q12: How useful are the guidelines for teaching through Community Problem Solving in this sample lesson plan? Why? Q13: Identify how easy or difficult it will be for you to do introduce each of the eight steps in Community Problem Solving in your teaching situation. Q14: After you have trailed using Community Problem Solving with a class, review the process using questions such as these. 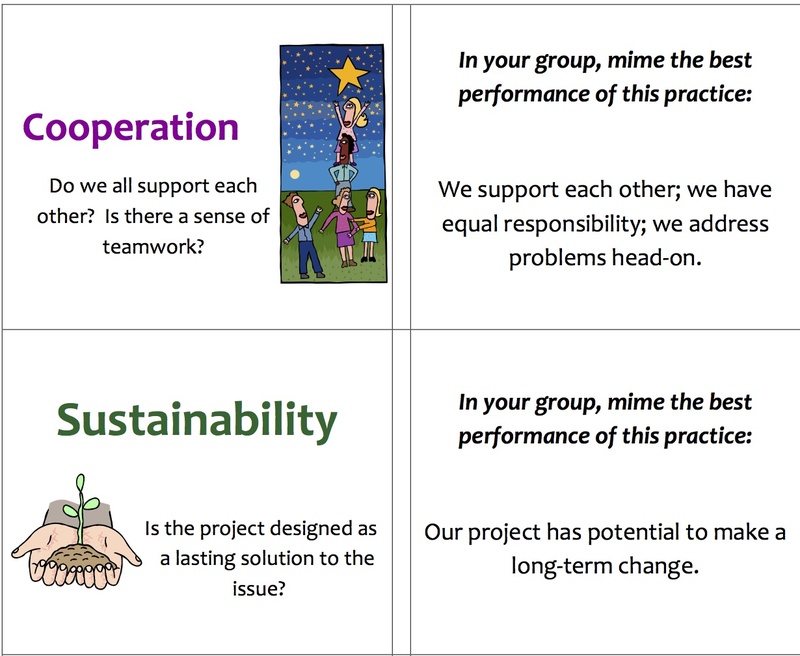 •What aspects of the Community Problem Solving project were really successful? •Was there anything that you forgot to plan? •Did your students need more preparation before the fieldwork? In what area? What changes will you make to this project before doing it with another class?